Large, spreading, open, deciduous shrub with arching reddish-brown shoots. Alternately arranged, tapering mid-green leaves up to 18cm long. 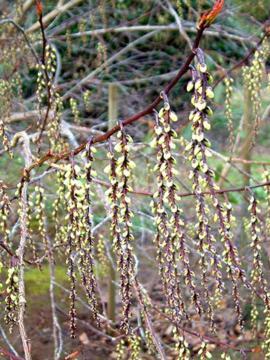 Stiffly pendant racemes of bell-shaped pale yellow flowers, which develop in autumn but do not open until March. Fertile, humus-rich, moist, well drained, acid soil in sun or part shade. Best in a position sheltered from cold drying winds. May be trained against a wall. From seed or heeled, semi-ripe cuttings in summer. Shrub border or woodland garden. Intrdoced from Japan in 1864.